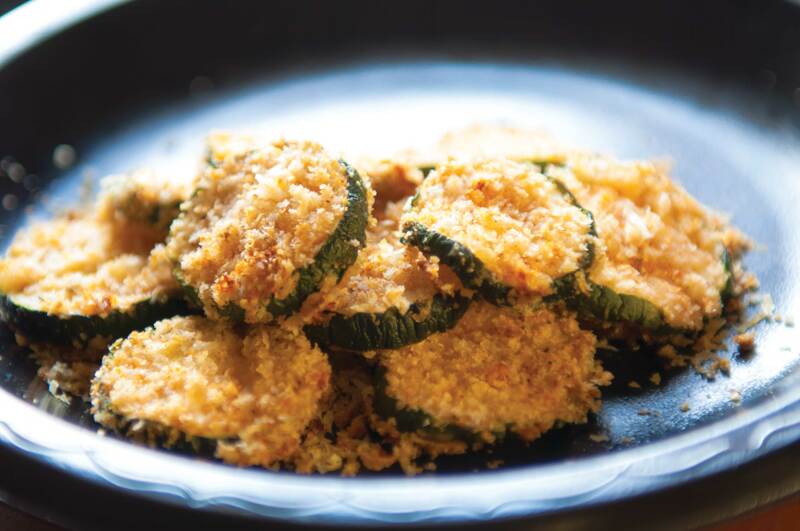 Healthy snacks no longer have to be dull and flavorless thanks to easy-to-make zucchini chips. Not only are they good for you, they are packed with flavor to satisfy midday hunger or late-night cravings. They are simple enough for a person with little to no cooking experience to prepare. All you need is an oven, cooking sheet, a few simple ingredients and 30 minutes to spare. 2 tablespoons of any grated cheese. Parmesan cheese is recommended because of its sharp flavor. Directions: Preheat the oven to 425 degrees Fahrenheit. Rinse the zucchini and slice into thin rounds. Pour the reduced-fat milk into a small bowl. In a larger bowl, combine the plain and panko breadcrumbs. Next add the cheese, salt, pepper and the spice into the mixture. Take the sliced zucchini rounds and dip them into the milk first, which will make the dry ingredients bond better to the zucchini. Take rounds that were dipped in milk and add it to the dry ingredients, coating it evenly so that the entire round is covered. Make sure it is even, as this will help the baking process. On a wired rack, apply an even amount of cooking spray. Place the rack on top of a cooking sheet. This allows for both sides of the zucchini to cook evenly without the hassle of rotating them. Bake for 30 minutes, let cool and enjoy.